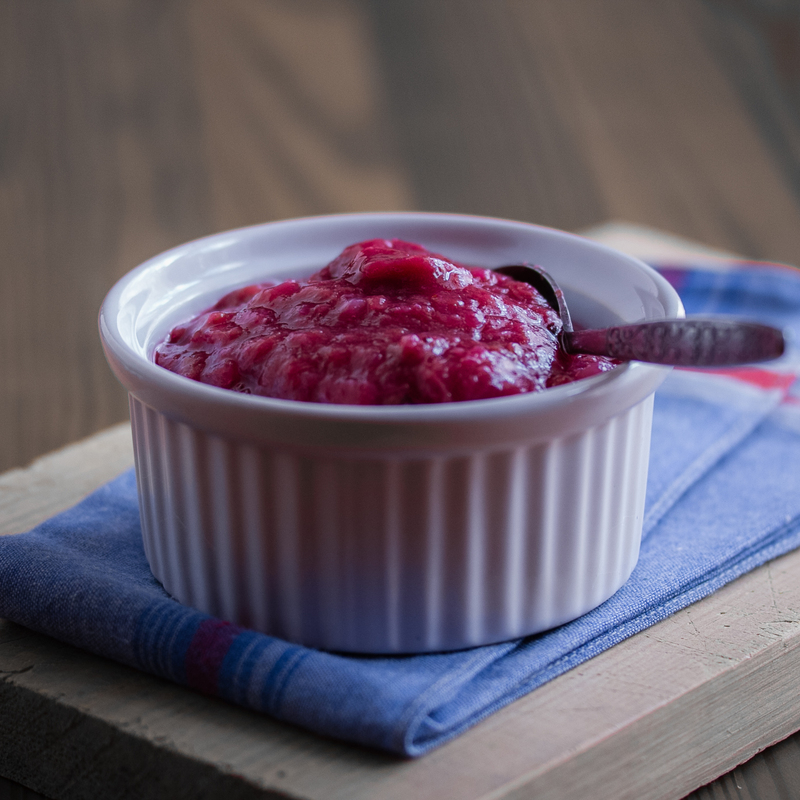 Rhubarb Chutney (Vegan) - Low-Carb, So Simple! -- gluten-free, sugar-free recipes with 5 ingredients or less | Low-Carb, So Simple! The method is very simple, just combine all ingredients and let simmer until soft. The chopping of the ingredients is the most laborious part. It’s a good idea to chop the onion quite fine, otherwise there will be big, hard and raw chunks of onion in the ready chutney. You can also use ready minced garlic, but fresh garlic is always better. Mix really well and then just simmer over low heat until soft. You might have the urge to mix the chutney often while it’s simmering. Just be patient and mix only a few times. 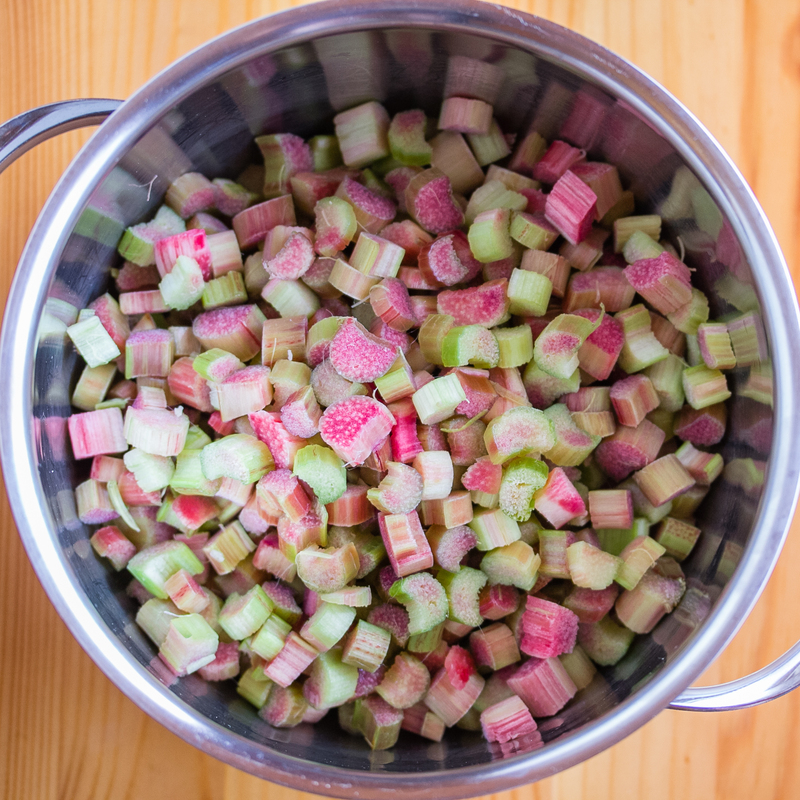 The result should be chunky, and excess mixing will break the piquant-tasting rhubarb chunks. Keep the heat low enough to prevent burning and to ensure that the mixture doesn’t burn on the bottom of the saucepan. Simmer, covered, over low heat until preferred consistency is reached. Usually this takes some 20–30 minutes. Mix thoroughly but gently every 5 minutes. 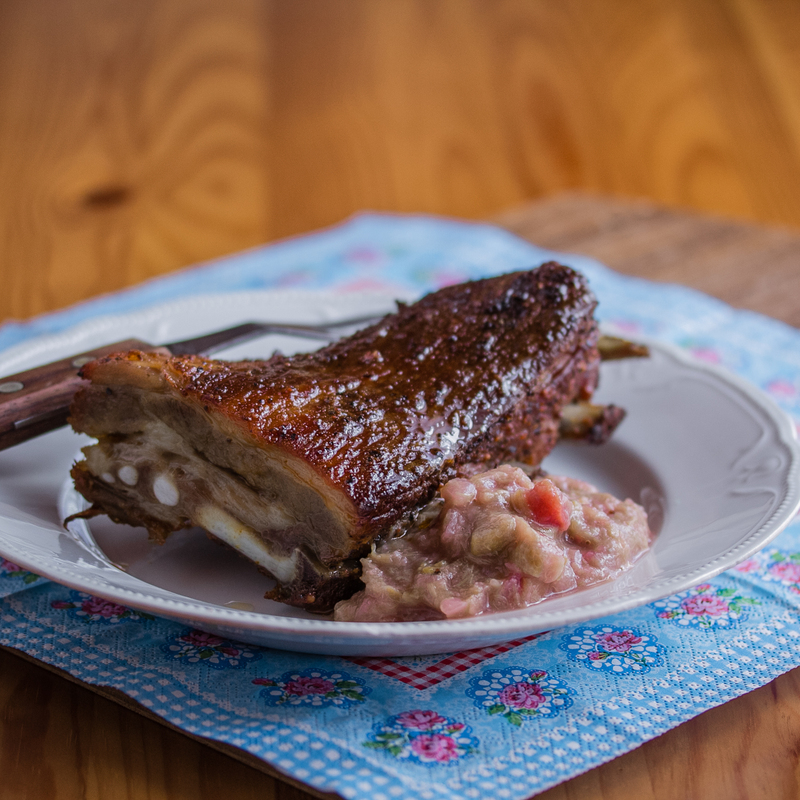 As I have spent some time in our summer cottage which is in the middle of nowhere, I had to develop recipes from the ingredients which I happened to have at hand. My mom brought bucketfuls of rhubarb stalks, so I had to invent some use for those. Ideas started flowing through my mind, and the hardest part was to decide the best idea which to choose for further development. First I tried a version of rhubarb crisp, but since the topping turned out mushy-slushy mess rather than crunchy-crispy heaven on top of soft, oozing rhubarb filling, I decided to give up the idea. Obviously I should have cooked the rhubarb filling first to keep the top crusty. And that was too complicated for my simplifying-oriented brain. I was thinking of desserts from rhubarb fool to meringue-topped rhubarb pie. Then it suddenly hit me that why does it have to be dessert? Would there be something more useful, a multi-use rhubarb dish? Something what you can add to your breakfast omelet, lunch chicken and barbecue dinner? Rhubarb chutney! Tart, tangy, slightly sweet. You can basically add it everywhere. That sounded perfect. 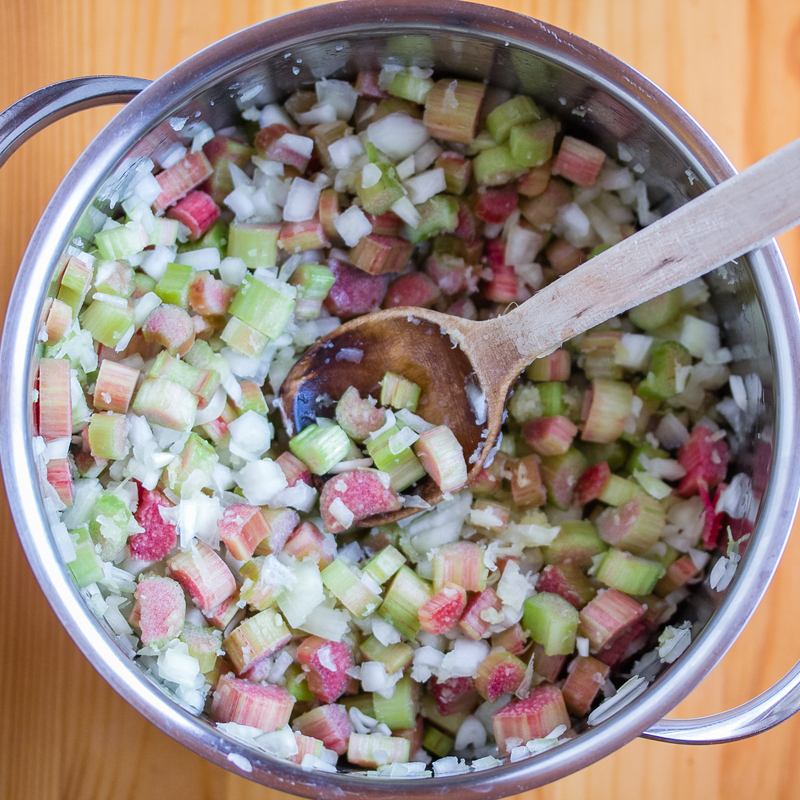 I think there exists countless recipes for rhubarb chutney, but as I like to research and explore, I wanted to develop my own recipe from scratch and check out how different seasonings and flavors go with each other. So what do I need? The self-evident rhubarb, yes, but how much? Let’s start with 4 cups (950 ml). And what other ingredients in addition? Onions, naturally. At least to me fruity chutney is not chutney without onion. Since chutney is acidic, I needed some vinegar, too. Apple cider vinegar was perfect. It was healthful, fruitier and milder than for example spirit vinegar. I still needed something to sweeten the chutney. Stevia, the reliable all-round sweetener, was again my choice. I really have been using much stevia lately. It’s just so convenient: just a few drops and the flavor of drinks and desserts raise to upper spheres. And now, stevia was about to raise the flavor of the chutney to those upper spheres. 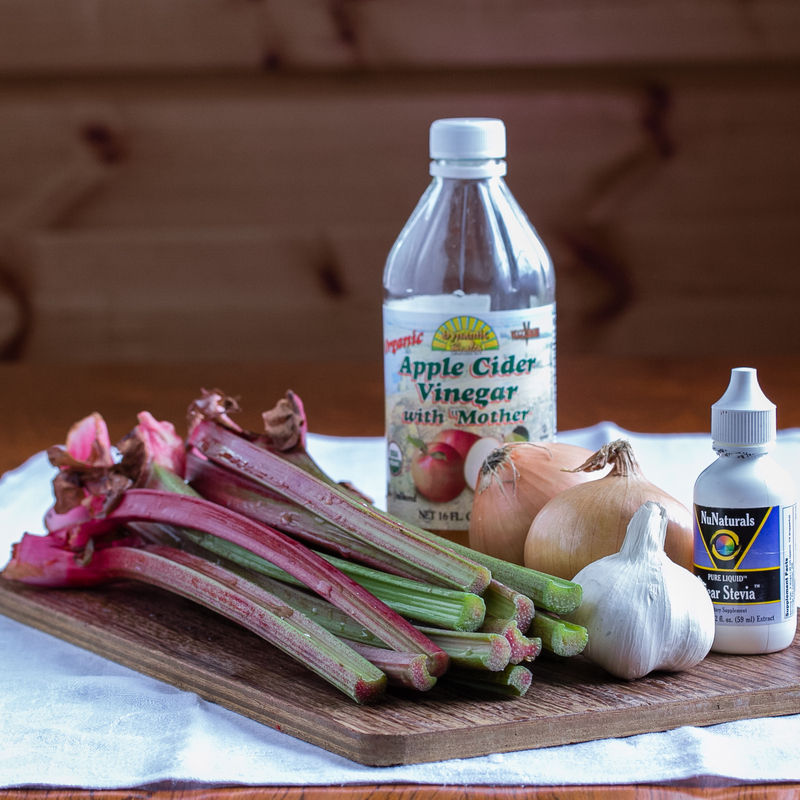 Rhubarb, onion, ACV and stevia. The basic ingredients were together. I still needed some spices. Since I was developing the recipe in the summer cottage, I didn’t have that extensive collection of spices and seasonings available. I opened the drawer and started exploring the content. I picked some seasonings which I wanted to test with the rhubarb chutney. But first, I had to prepare the chutney. First, I combined 4 1/4 cups (1 l) chopped rhubarb, 1 small onion, 1/3 cup (80 ml) apple cider vinegar and 40 drops stevia. I simmered the chutney over medium-low heat for 15 minutes, stirring every now and then. Then the most exciting part: the first tasting. That first version was really tart and tangy, so I added another 10 drops stevia. Rhubarb was quite overpowering, the amount of onion could have been bigger to compensate the overwhelming rhubarb. The amount of apple cider vinegar was just right, less would have been lame and more too acidic. From the list above I chose garlic to my final recipe. Why? 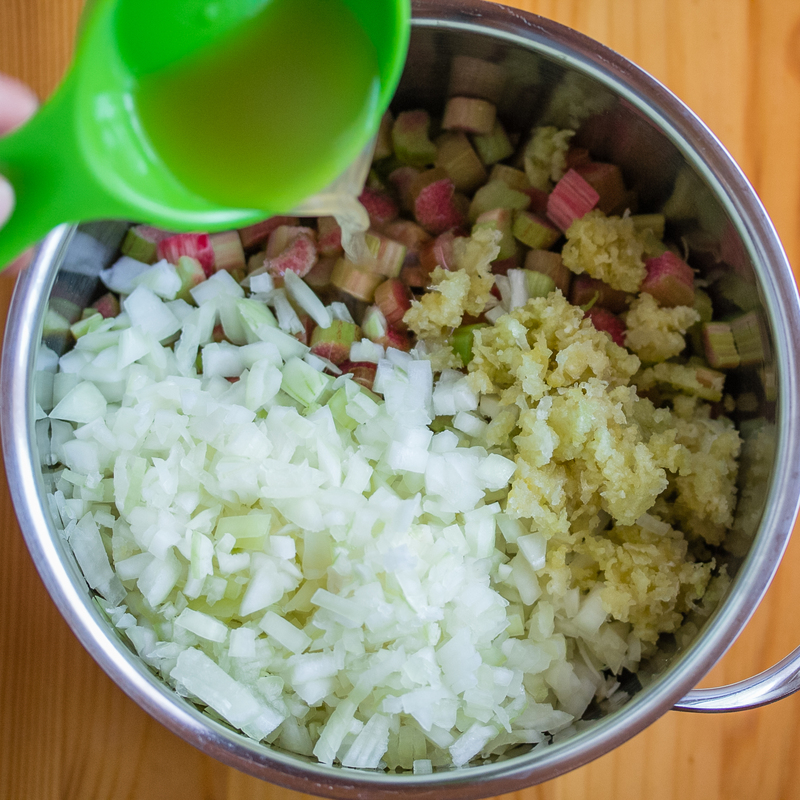 It just felt right and it made a great companion to the ordinary onion and rustic rhubarb. You can replace the apple cider vinegar with some other type of vinegar. 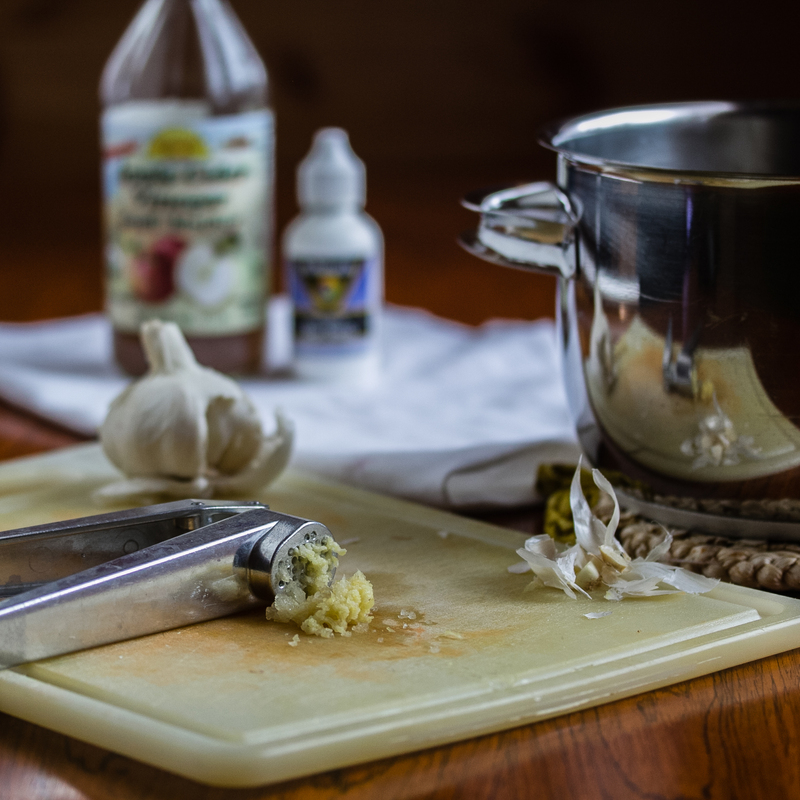 ACV is relatively mild vinegar, so you might want to use smaller amount of stronger-tasting vinegar (like spirit vinegar), otherwise the ready chutney might taste too acidic. 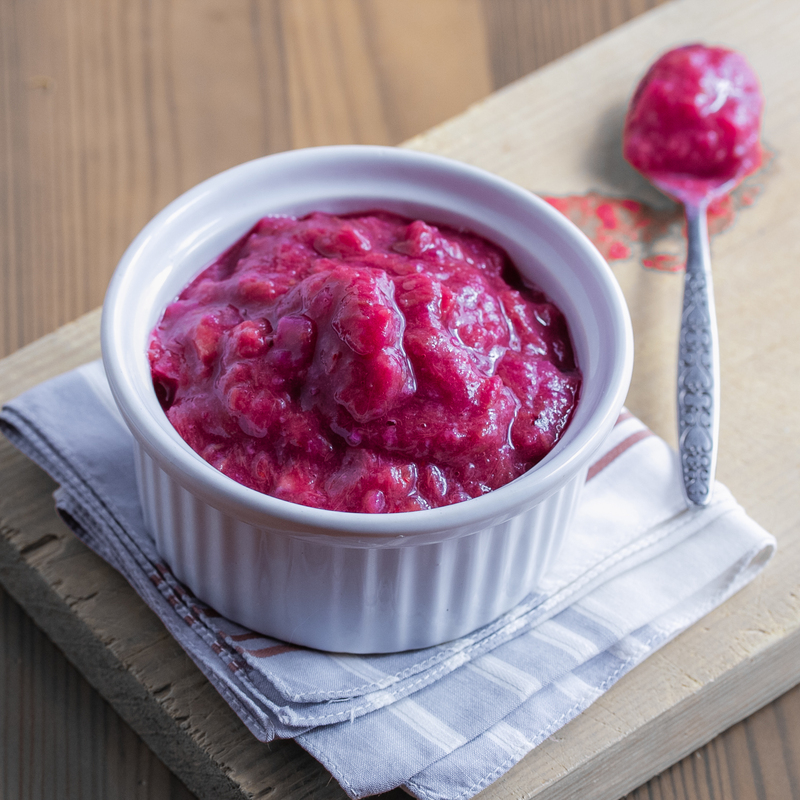 For milder flavor, you can replace part of the rhubarb with peeled and sliced apples, grated carrot or roasted pumpkin. Apples and carrot bring some carbs, so be aware of that if you are counting carbs strictly. I like to color this otherwise dull-colored accompaniment to something more appetizing and fancier. Actually, the variety of rhubarb affects to the color of the ready chutney as well. Since my rhubarbs ended up with almost no color after cooking, I had to invent something to brighten and boost the color in a natural way. I’m not comfortable with artificial food colors. First I wanted some red hue. Since chutney is acidic, I thought blueberry might react with the acid and produce red color. I mashed some thawed blueberries and mixed them with the chutney. I needed only a tiny amount of blueberries to create bright pinkish hue. Perfect! Another suitable colors were orange and yellow. For that I added some turmeric. The chutney turned into nice orange-colored sauce. Even better, the turmeric gave a hint of exotic, piquant taste which went well with the other flavors. Hi Elviira! Your chutney looks like it would make a beautiful addition to my homemade Christmas gift baskets! Is it safe to assume this recipe can be preserved via standard boiling-water processing? Have you canned it yourself? If so, I wonder how many 1/2 pint jars I could fill with your recipe as written? 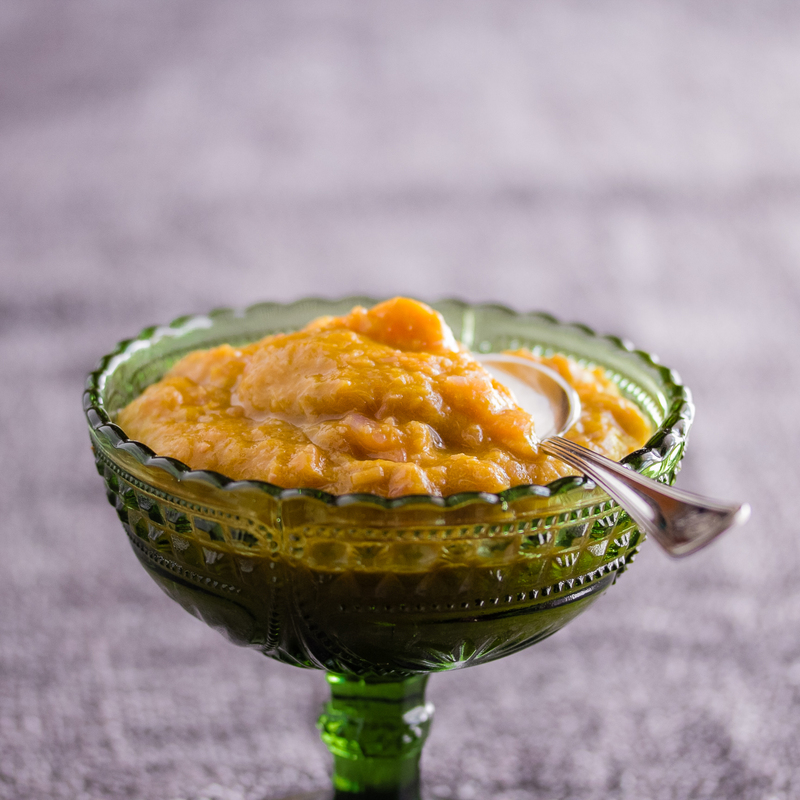 I also wondered if you used any thickeners, or an immersion blender to make the pretty red and yellow-orange colored versions, or is it simply cooked down until most liquid evaporates? Hi Colleen, thanks for your comment! Yes, I expect regular canning methods work perfectly for this recipe. I haven’t done too much canning, though. The chutney is simply cooked down so that the liquid evaporates and the chutney is smooth (you can also leave it chunky, just don’t mix it that often). Could you add some pineapple to this? Absolutely! In case you don’t have to restrict your carbs. You might want to adjust the amount of sweetener, though, as pineapple is quite sweet. Your website does not allow printing. I can’t copy and paste, either. why is that? Sorry! There has been a print button but I don’t know why it has disappeared! Now I used another plugin to show the recipe. You should be able to print that easily now. 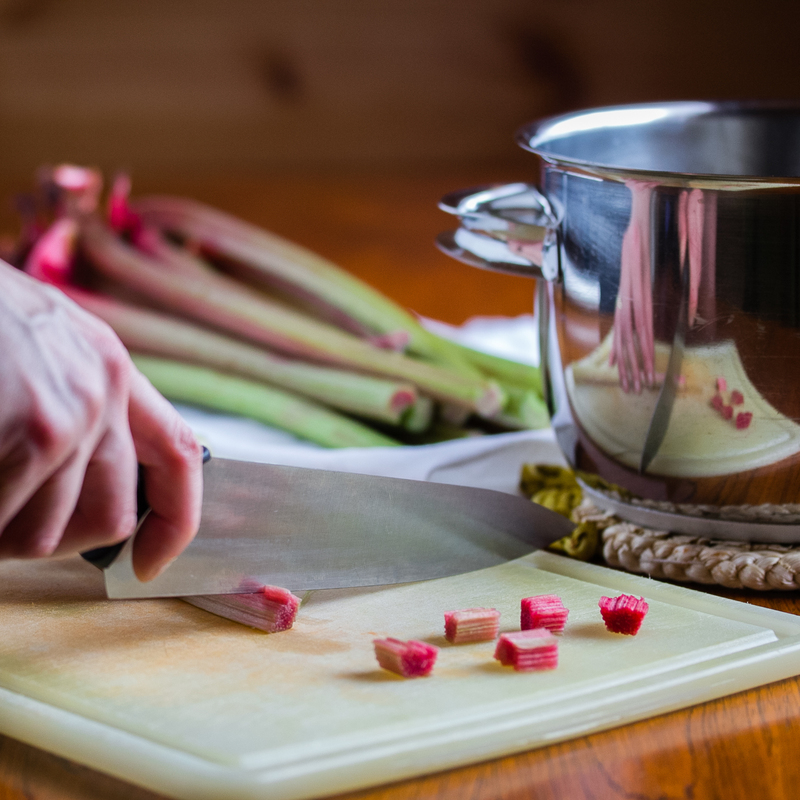 My husband loves rhubarb, so I am very excited to make this. Could you offer suggestions of what else to serve it with? Thanks! Hi Lia! My favorite is grass-fed pork and rhubarb chutney. The chutney is great with any grilled meat or fish, like beef, chicken and salmon. My dad, who doesn’t eat red meat likes it with veggies, especially with vegetable gratin or vegetables with creamy sauce. This looks delicious. I usually make one with strawberries as well but can’t wait to try it with just rhubarb. Thanks, Kristen! This one is really strong tasting with all that rhubarb, onion and garlic. A little goes a long way. I personally prefer this chutney especially with grass-fed pork.